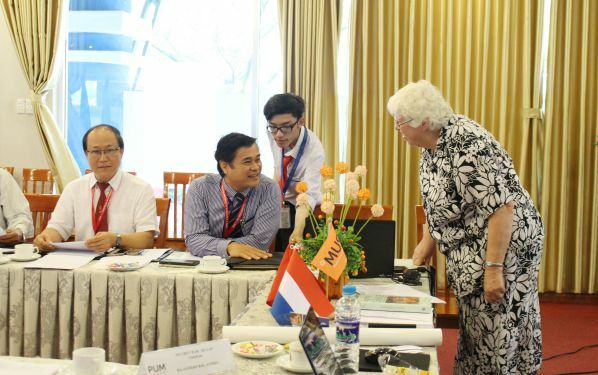 In the morning of March 18, 2017, at the meeting room 3, PUM senior expert (Netherland), Mrs Anneke Bal-Atsma had the working session with Dr. Phan Ngoc Son – Rector, Dr. Tran Duc Thuan – Vice Rector and Heads, Vice Heads of DNTU’s department. Stated working session, Mrs Anneke invited everyone watch clip about the parable of blind men and elephant. The purpose of her is to transfer for everyone about a message: “normally, depends on each way to approach aspect of problems of each person, there will have separate points of view, and they always protect their points of view. However, in reality, because they can not embrace all aspects of problems, so they should listen to advices, share together, discuss to have the best identifications, solutions for a problems. From that points, they will have exact, suitable development process. 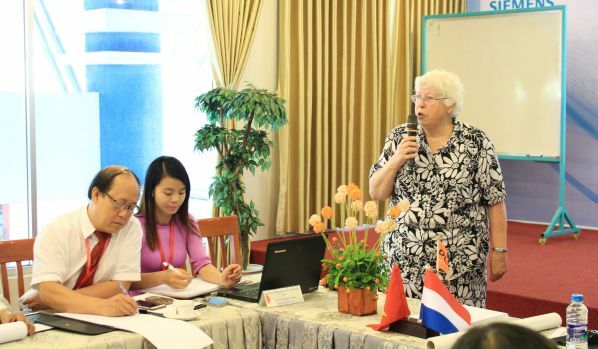 Next, Mrs Anneke introduce a method “Learn to change – Guidance for managers want to change organization structure” of 2 authors Leon de Caluwe and Hans Vermaak. These Professor developed a test to indentify what kind of personality you are. Each kind of personality has separate color. This method starts by personal test: Learn to innovate, choose answers which is the most suitable for yourself. All the questions was translate to Vietnamese. Expert invited people who attended in this meeting room to do a test about colors. This colors test helps everyone have a close look about mind and action in change process. Experiments show us about our hobbies is relevant to corresponding models. This model have shown by 5 colors: green, blue, red, yellow and white. It is also show us levels which thoughts and actions of each person is corresponding. This test is suitable for everyone: consider an aspect or more aspect, in our lives, everyone always change. After had completed this test, group of people had different colors will be rate as each group and discuss together about one problem and analyze problems depend on regulation strategy creation or creative follow by method of Disney. How can we recognize that we have the best lecturers of university? To recognize, we need to follow these elements: Skill: Having soft skills and professional working skills; Attitude: Love job, ready to help student in study and research; Knowledge: Good, having a good professional knowledge; Good working environment, having more opportunities to develop; haing good salary; modern equipment; good teaching method, having interaction with student; Having many science researches; Vision and mission of university; the rate of having job after graduated of student have to high; having a good connection with school and enterprise. What are elements we need to apply these modern teaching methodology? 1. Human: including Administration, lecturers, students, leaders. Administration need to have a strategy vision. Student excited when learning. Lecturers have ability, progressive and mind. 2. Training Program: Having suitable training program, catch up with integration trend. 3. Having good facilities suitable for studying and researching. What should a university do to attract public more? Need to bring outdoor activities to outside. Practicing while leanring. Invite the other lecturers to come to discuss; Holding workshops, job market festival, invite experts, speakers, singers; Do charity activities, opening soft skill classes; Invest in training quality, judge the ability of students; Cooperate with foreign partners; Give scholarships for gift students have hard living condition. How can we persuade enterprises about the quality of our students? 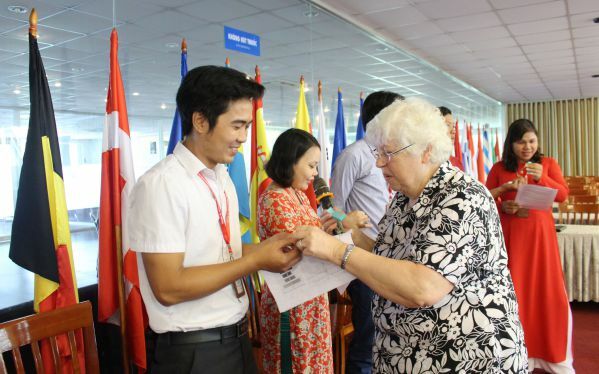 Student is equipped with essential knowledge, soft skill, foreign language ability, ability to use computer, communication ability; Increase connection with enterprises; Always catch up with progressive trend; innovate of the world, so students will not be backward. What need university to do to attract care, love and attention of students? 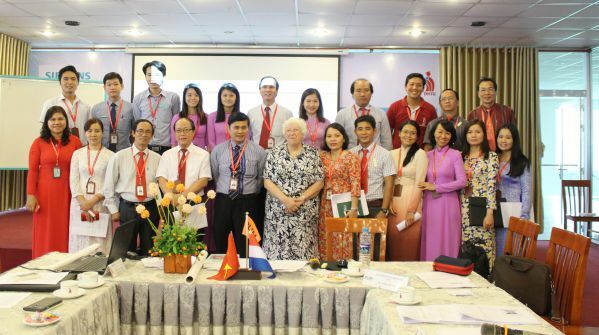 Ended up working session, Dr. Phan Ngoc Son – Rector had comments: It is essential for DNTU to renew mind. He expressed his desire, he want all of staff will be manager in the future, so it is essential to renew our mind, catch up with trend of our society. Moreover, DNTU have to be grateful to contributions of PUM experts, use this resources to make DNTU more developed. Dr. Tran Duc Thuan – Vice Rector expressed his points of view: DNTU is a family, and we have to do innovation. Since PUM experts have come here, they helped us to change tremendously step-by-step. We not only increase quantity, but also increase quality of our students and our lecturers. PUM experts’ mission is help us to design, build and innovate training program. So, we have to change our weak affairs and promote strong affairs to develop day-by-day.